This was taken by NASA Apollo astronauts on the 7th December 1972, while the Apollo 17 mission was on its way to the moon. It has become one of the most famous photographs ever taken, and has been widely credited as providing an important contribution to the ‘green revolution’, which was rapidly growing in the early 1970s. The Apollo astronauts had the benefit of a high-quality Hasselblad film camera to take their photographs – hence the significantly higher quality. Part of the reason that this image has become so famous, is because there haven’t been any more like it – Apollo 17 was the last manned lunar mission, and we haven’t sent humans that far away from the Earth since. NASA has released a number of mosaics of satellite images from satellites such as MODIS and Landsat and called these ‘Blue Marble’ images – but they’re not quite the same thing! Anyway, fast-forwarding to 2015…and NASA launched DSCOVR, the Deep Space Climate Observatory satellite (after a long political battle with climate-change-denying politicians in the United States). Rather than orbiting relatively close to the Earth (around 700km for polar orbiting satellites, and 35,000km for geostationary satellites), DSCOVR sits at the ‘Earth-Sun L1 Lagrangian point’, around 1.5 million km from Earth! At this distance, it can do a lot of exciting things – such as monitor the solar wind and Coronal Mass Ejections – as it has a continuous view of both the sun and Earth. 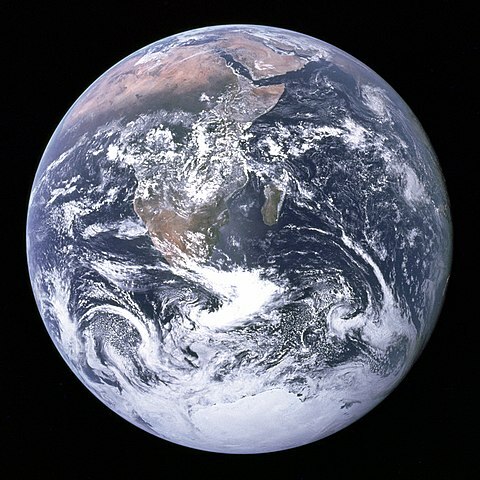 From our point of view here, the Earth part of this is the most interesting – as it will constantly view the sunny side of the Earth, allowing it to take ‘Blue Marble’ images multiple times a day. The instrument that acquires these images is called the Earth Polychromatic Imaging Camera (EPIC, hence my little pun in the title), and it takes many sequential Blue Marble images every day. At least a dozen of these images each day are made available on the DSCOVR:EPIC website – within 36 hours of being taken. As well as providing beautiful images (with multiple images per day meaning that it’s almost certain that one of the images will cover the part of the Earth where you live! ), EPIC can also be used for proper remote-sensing science – allowing scientists to monitor vegetation health, aerosol effects and more at a very broad spatial scale (but with a very high frequently). So, in forty years we have moved from a single photograph, taken by a human risking his life around 45,000km from Earth, to multiple daily photographs taken by a satellite orbiting at 1.5 million km from Earth – and providing useful scientific data at the same time (other instruments on DSCOVR will provide warnings of ‘solar storms’ to allow systems on Earth to be protected before the ‘storm’ arrives – but that’s not my area of expertise). So, click this link and go and look at what the Earth looked like yesterday, from 1.5 million km away, and marvel at the beautiful planet we live on.